Rarely do I rave about other authors’ books. But occasionally, I feel I must. I ran across C.J. Box’s books in the local library. I’d never heard of him. I haven’t yet figured out what makes me pick up a particular book by an unknown (to me) author. Maybe it helps if I see more than one title because that makes me think they must know what they’re doing if they got more than one book published. Even though I write romance novels mostly, I don’t, as a general rule, read romance novels. I like suspense which are often categorized as mystery. I’m not sure where that line is, but Box’s books are in the mystery section. Don’t bore me with extraneous details unimportant to the story. Plot had better make sense. If I’ve figured out your schtick (i.e. you do the same thing in every book) after two or three books I’ll give up on you. 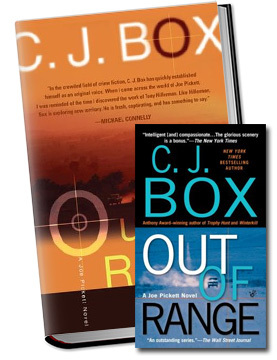 Box has a couple of series, but what he’s best known for, apparently, is the series featuring a Wyoming game warden, Joe Pickett. In Out of Range, which I just finished, we see Joe tempted by a seductress, but he doesn’t give in, even though it would be so easy. He has a conscience! That’s what I like about Joe Pickett. He sometimes bends the rules, but he always stays true to himself and he doesn’t take the easy way out. Maybe it’s just refreshing to find a character who flirts with danger and difficult situations every day, who’s a family man and knows the value of what he’s got. He knows what’s important. Joe tends to blunder into trouble in much the same way Janet Evanovich’s Stephanie Plum does. But Joe is more prepared, much more capable, and he isn’t afraid to use a gun if he has to. But that’s usually reserved as a last resort. Not too many series set in Wyoming, I would guess, where the recurring protagonist is a game warden. Box uses the territory (mountains, weather, forests, sparse population) as a character, almost. This is unforgiving land and survival is a challenge. I don’t care if books are written in a series and I don’t read them in order. If I missed something, I’ll find out about it when I read that book in the series. I think you can read any of these novels as stand-alones and not know what you’d missed. I also enjoyed Box’s shorter series featuring a sort of anti-hero cop named Cody Hoyt who really bent the rules. And Box has written other books which are not part of either series. I started with Three Weeks To Say Goodbye and more recently read Blue Heaven. If I find an author I love, I’ll read every thing they write. In this case, since I apparently came late to C.J. Box’s writing party, I’m kind of hoping he writes faster than I read so I don’t catch up and have to wait for his next book. C.J. Box, mystery novels, suspense novels. Bookmark.